The Ganges River is the 34th longest river in the world at 2,620km, flowing down through the Himalayas to form the Gangetic Plain of North India eventually to discharge into the Bay of Bengal through Bangladesh. The Hooghly river connects the Ganges river to Kolkata with a ship lock as part of the Farakka Barrage that diverts water away from Bangladesh. The Ganges river is the cradle of Indian civilisation and is sacred to Hindus. To bathe in the waters of the "Holy Ganga" is a form of purification, and to be cremated at the Ghats [stepped riverside terraces] of Varanasi the ambition of every living Hindu. The river was used for navigation in British colonial times with steamer services between Calcutta, Patna and even further upriver. Massive irrigation schemes later diverted waters and the construction of railways, and later roads with low bridges effectively killed river transportation and the navigation channels silted up. In recent years, much has been done to improve navigation and Patna can be reached year-round and at certain times Varanasi too. 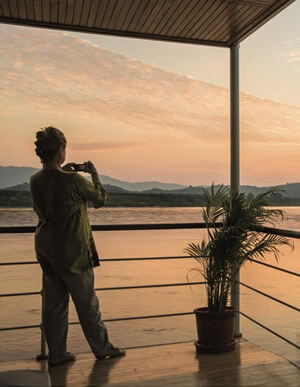 Experiencing a Ganges river cruise is the only sensible way to see India, avoiding its now-congested roads and all the other inconveniences of travel today in India. There is much to see along the way – historically, culturally and for bird and wildlife. This is a river that offers rich experiences.